My work requires a lot of physical activities. A lot of times, it is not an ideal environment for me to have my wedding ring on as it damage it. 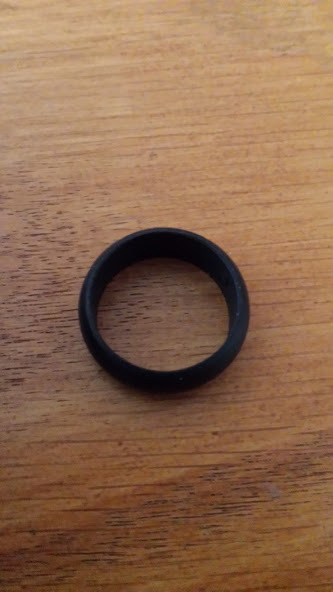 This ring is a perfect solution because it is actually made of Silicone. For those of you who can't picture it, silicone is like soft rubber material but durable. At first, I found it difficult to find my ring size using the links they provided on the ring sizing guide. I would like to mention that both have not been the best guides. The first one, where you cut out a ruler and wrap it around your finger was very promising. However, the dimensions of the ruler must be wrong because when I wrap it around my fingers, the sizes are too small that I'm past the guide already. I did not use any zoom on my printer. If I knew beforehand that it's a soft, stretchable ring, then I can assume to go for the smaller size. To make the long story short, I bought the wrong size, going for size 9. But customer service was understanding and helpful and Sent me the correct size. That meant a lot to me and I felt that they back up their products. The quality is great. The packaging is elegant. The extra BONUS ring was lovely. It is comfortable on my fingers. 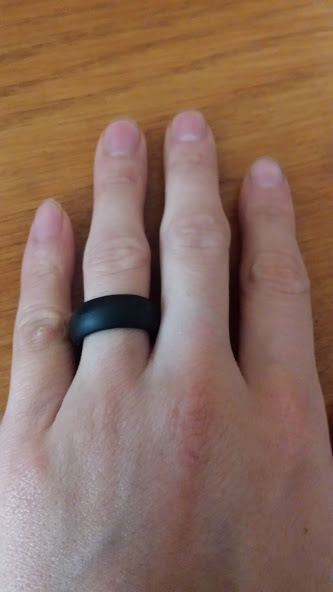 Initially I was weary of wearing a black color ring. But now, seeing it under different lighting conditions, I feel it is unique and gives off an air of mystery. Sometimes, it even looks purple. I also like the matte sheen on it because it reflects of as various colors depending on the environment. In any case, I am happy about the color and am on practical note, it helps me to carry on my daily physical activities without worrying if the ring would get damaged or scratched. It is also easy to wash and dry. Negatives: My only concern is due to its material, the ring is very light and is somewhat slippery. I lost my 1st ring the first night. Part of the solution is to get the ring with the right size so it be more snugly fit on your finger. Disclaimer: I paid for this product with a discounted price from the maker in exchange for an honest review.